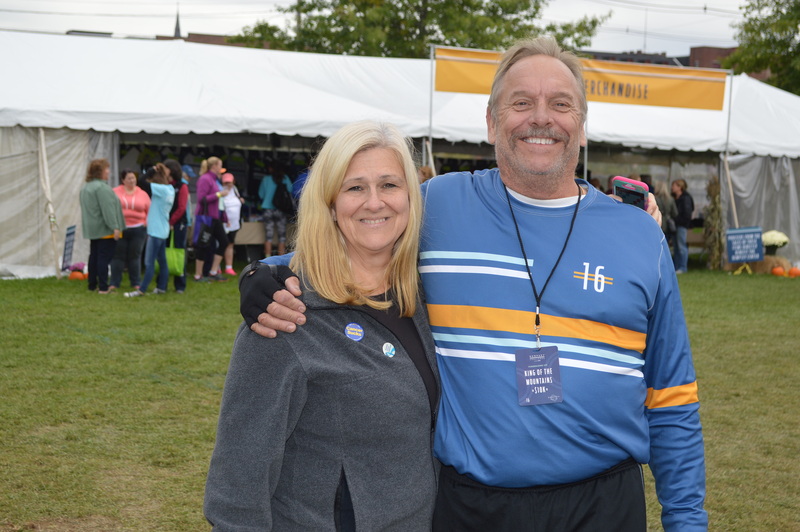 George Vooris from Naples and his wife, Janis, at last year’s Dempsey Challenge. Three years ago, in his first year at the challenge, Vooris raised $210. This year he raised $17,825. LEWISTON — After nearly 18 months of crippling arthritis and psoriasis, George Vooris was finally able to move. In 2015, the then-55-year-old celebrated by running 5Ks for the first time in his life. That fall, he found himself at the Dempsey Challenge. Looking at other racers that day, he noticed all the cancer survivor T-shirts, the number of people wearing wigs and missing eyebrows. That first year he’d raised $210. This year, $17,825. Thousands of fundraisers with Vooris’ passion will fill the Twin Cities this weekend for the ninth annual Dempsey Challenge, the Dempsey Center’s largest fundraiser of the year. Founded in 2008 by actor Patrick Dempsey, inspired by his mother’s battle with cancer, the center provides free services and support for cancer patients and their families. The challenge has raised millions of dollars over the past eight years, breaking a record with $1.3 million last year. In addition to the nearly 3,800 participants in 2016, it drew another 1,000 volunteers who will once again gather at points along the route to cheer cyclists on and work the Festival in the Park at Simard-Payne Memorial Park in Lewiston on Saturday and Sunday. According to a spokeswoman, 3,436 people are scheduled to walk, run or cycle this year. Vooris will run and walk the 5K on Saturday and he’s contemplating getting on his bike for the 10-mile course on Sunday. Four years ago, Vooris said 80 percent of his body was riddled with psoriasis and the cartilage in his joints was so inflamed he couldn’t walk. After getting a diagnosis and the right medicine, a form of a chemotherapy drug, he was mobile within a few months. Vooris, who owns a painting business, said his first impression of the Dempsey Challenge was the fun, carnival atmosphere of the event. His next impression was of the strength of the cancer survivors around him and being touched by the work of the Dempsey Center. To fundraise he now organizes a 5K race, partners on raffles and promotions with local retailers and has even organized comedy and trivia nights. Anything he can think of.